11411 ft (3478 m) . 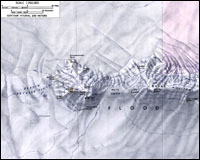 Mount Berlin is the highest volcano in the western part of Marie Byrd Land and the sixth highest overall in Antarctica. 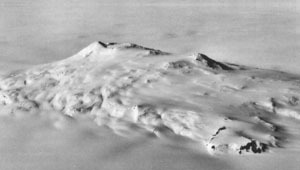 This is an impressive mountain, a broad shield surmounted by a steeper summit cone capped by a 1.2 mile (2 km) wide caldera. Steaming fumaroles have been observed along the rim of the crater, revealing that Mount Berlin must still be considered active. The base of the volcano is completely surrounded by the West Antarctic Ice Sheet, with an exposure above ice level of about 7000 ft (2100 m) on the north side and 5000 ft (1500 m) on the south side.